Horsebacking riding in the Puerto Vallarta area is a wonderful and exciting way to experience the Mexican countryside, the Sierra Madre mountains, the beach, and a waterfall. Mexican cowboys have been an important part of Puerto Vallarta life for centuries, and there are numerous long-established riding trails. Most tour operators are based on family-owned ranches, and offer rides that range from a few hours to overnight. All of the tour guides recommended below run very professional operations, are bilingual, and have many years of experience. Rancho Charro offers various horseback riding tours including a ride that takes guests to a historic gold and silver mining town that dates back to 1602. Another horseback ride starts at a charming village located just 15 minutes from the hotel zone with the ride proceeding along trails through majestic jungle foothills bordered by a tropical river up to a sparkling swimming hole, waterfall, and lookout point with great views of the ocean. Tours stop for a lunch break at a rustic restaurant along the riverbank that serves good food. Tours currently available are: Tropical Forest Ride, Natural Wonders BBQ Trail Ride, and All Day Adventure Ride. Guides are experienced wranglers. After the tour transportation is provided back to your hotel. Rancho Charro offers a 10% discount for reservations made online. Located 10 km south of Puerto Vallarta, this family-owned business provides excellent horseback riding tours. Their most popular trip is a 3-hour excursion deep into the lush jungle to El Eden, the area where the sci-fi movie Predator was filmed. For this trip horseback riding is one hour each way, with an additional hour for swimming in the river and enjoying a good meal, which is not included in the tour price. This tour operator is a top favorite among vacationers. In May 2013, the price was $25 USD per person. 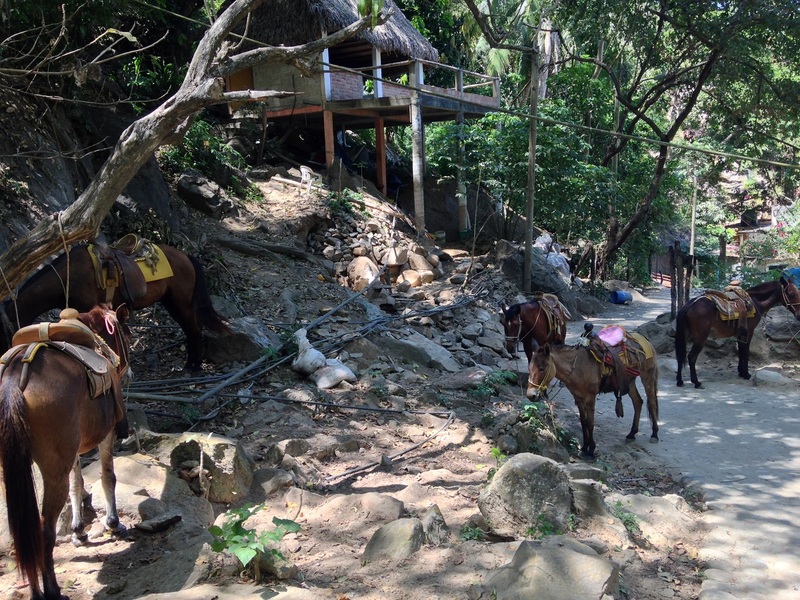 Horseback along Sayulita’s beautiful beaches up through the lush jungle to areas offering breathtaking views. Guided tours are one hour, two hours, or four hours. Horses are available for all levels of riding experience. Horseback riding tours depart from 9 a.m. to 7 p.m. daily. The cost of the tour includes drinks and transportation.